This quartet of cute Thanksgiving characters is sure to delight the little ones seated at the children's table this holiday. Made with fold-open honeycomb tissue paper bodies, these three-dimensional decorations are printed on both sides so that they can be enjoyed by everyone seated around the dinner table. 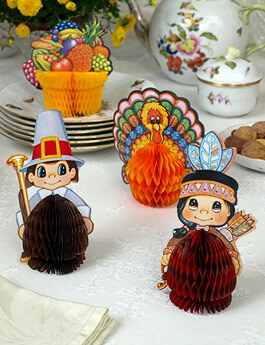 The colorfully-hued cardstock characters range in height from the 4½" basket of plenty and 5" turkey to the 6" high Pilgrim boy and Native American girl figures. Made in Taiwan expressly for the original American maker, using designs from their archives.